The What: EvertzAV introduced a new series of 4K/UHD HDMI gateways that support up to 4096x2160 resolution at 60Hz and 4:4:4 color sub-sampling. The new MMA10G-TRS4K and TRM4K gateways are the latest 4K/60 products to join the MMA-10G family. The What Else: The MMA10G-TRS4K, designed for in-room quiet operation, is a standalone HDMI 4K/60 transceiver that supports bidirectional transport of UHD content up to 4096x2160 at 60Hz with 4:4:4 color sub-sampling. The MMA10G-TRM4K is a modular gateway that can be installed in a number of modular Evertz rack mount frames (with dual power supplies as an option). Both the MMA10G-TRS4K and TRM4K have ordering options to enable full USB 2.0 support for KVM applications. 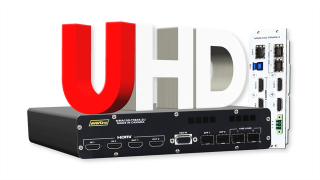 The Bottom Line: The gateways have two 4K/60 HDMI inputs and outputs, plus a compliment of analog audio and USB, allowing them to transmit and receive two UHD images at the highest visual quality and lowest latency all over a single 10GE network connection. The new TRS4K and TRM4K work within Evertz’ MMA-10G network-based distribution platform offering backwards compatibility while at the same time providing the latest generation of HDMI interfaces.